An overview of the City Eco Lab site on its second Saturday. It was snowing in St Etienne but the place was packed. 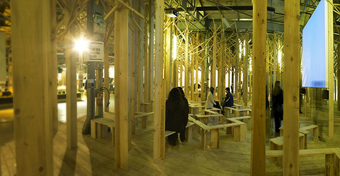 (80,000 people came to the biennial two years ago but many more seem to be expected this time). If you scroll down from this story, there are another 18 posts on specific projects. Some of Kristi's pix are here, Dori Gislason has put an album here, and Allan Chochinov - Mr Core77 - has blogged the bienniale here. Marcia Caines has now posted an excellent review here at the Cluster website. Brice Pelleschi from exyzt has posted some fab City Eco Lab images at Flickr. And here are some more from Juha Huuskonen and a collection from "your bartender"also at flickr. Allan Chochinov has also posted a mini-movie. of me explaining the project as a whole. I look like something the dog just sicked up - but it was just after the opening. So be kind, listen to the words and visualize the pre-wrecked person I used to be. and here is the "Tools for Exchange" stand inside the Tool Shed created by Bethany Koby and Ellie Thornhill. The containers describe a wide variety of tools and organisational platforms for cooperation and sharing resources. The popular ones after a week seem to be community-supported agriculture, energy descent action planning (as used by Transition Towns), local economy trading schemes, alternative trade networks, and land- sharing platforms. Visitors add their own recommendations for tools by writing on the blank lables of other containers. And in the Explorers Club (above) food producers and citizens discuss ways to enhance the AMAP system of community supported agriculture. Next to the Explorers Club, in the Map Room (Salle des Cartes), Big Picture proposals from The Why factory are mixed up with maps of ecosystems and biodiversity in the Rhone Alps region.